A remarkable encounter took place at Paxton House recently, with the visit of His Excellency Joslyn Rafael Whiteman, the High Commissioner for Grenada and his daughter Paula. The High Commissioner first came to the UK in 1964, when he worked as a bus driver and in other menial jobs. He rose to become a successful business man here and a government minister back in Grenada, before entering the diplomatic service. 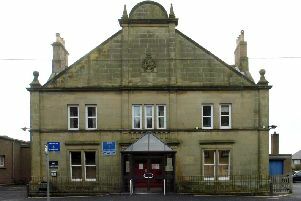 The house is now run by a Trust, but was formerly the country seat of the Home family - and Mr John Home Robertson, the former MP and MSP, and his wife, still reside in part of the building. In the 18th and 19th centuries, the family owned slave estates in Grenada. Ninian Home was appointed the Lieutenant Governor of Grenada in 1793, only to lose his life in an uprising two years later. High Commissioner Whiteman said: “I want to express my sincere thanks, on behalf of the Government and people of Grenada, and by extension my daughter Paula, for the opportunity afforded me to visit Paxton House. Dr David Golding CBE, of Newcastle University, who arranged the visit, said: “The High Commissioner and his daughter were Guests of Honour at the university.